This picture was taken a week after Matias' birth in December 2000. It currently hangs in the Post 53 building. Jim Anderson is on the left, Rachael Palacios in the red and Ruth Clark in the bottom right. Editor’s note: This is the first in an ongoing series exploring the children that were helped into this world by the volunteers at Post 53. DARIEN — In the early hours of Dec. 7, 2000, Rachael Palacios opened her eyes to see nearly 20 teenagers in her room. She had just given birth to her third son, Matias Martinez, so, needless to say, she was a bit surprised. The teenagers were part of the Post 53 EMS team who had answered the call to Palacios’ home to assist with Martinez’ birth, an unusual but not new occurrence for the volunteer organization. If you go up to the second floor of the Post 53 building, you’ll find a wall with several photographs. 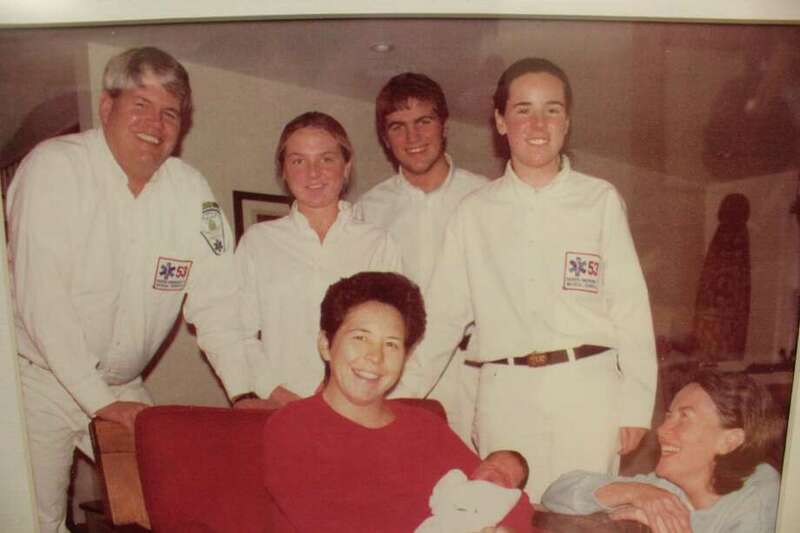 At first you’ll notice the “posties” in their traditional white clothes, but, upon a closer look, you’ll realize the pictures tell the stories of the babies who have been delivered by Post 53 volunteers. One of those stories is that of Martinez, who was born a little over 17 years ago in Darien at around 1 a.m. on Dec. 7, 2000. Palacios remembers the night of Dec. 6, 2000, perfectly. Palacios was expecting her son’s birth to be around the morning hours of Dec. 7, but when her water broke around midnight of Dec. 6, she instantly realized time was of the essence. Martinez’ father, Carlos, was on the way back from work in New York City. According to Palacios, Carlos remembers seeing all the police cars and the ambulance speeding down the Post Road as he arrived to the train station in Darien. Little did he know that he would be seeing those exact same cars only minutes later outside their home. Before the police or Post 53 got to Palacios’ home, Martinez was born. Clark came into the bedroom wanting nothing more but to see her newborn grandson. In the frenzy of the moment, Clark asked why the newborn baby wasn’t crying, but it was after she wrapped him up in a warm towel that his first cries were heard. That’s when Palacios heard the police arrive at the house, followed swiftly by the ambulance. “I will never forget it because one of the police said ‘sounds good to me’ (referring to the baby) as he stood by the door,” Palacios said. In the blink of an eye, Palacios’ room was swarmed by the Post 53 crew, who had responded to the 911 call. Palacios remembers staring wide-eyed at all the teenagers in the room. Jim Anderson, a Class A emergency medical technician, was one of the adult advisers who answered the call the night Martinez was born. “We got to the house just after Palacios had given birth, and the kids are usually the ones who are responsible for providing patient care unless I have to intervene. In this case, Palacios had done most of the hard work, and so we proceeded to cut the umbilical cord and take care of the baby in order to take him to the hospital,” Anderson said. Anderson said delivering babies is pretty unusual for the “posties,” though it does happen. Anderson has helped deliver four babies throughout his time as a “postie” since he joined in 1996 — he delivered two in Darien, one in Norwalk and another in Greenwich. “I remember this night particularly well because it was very straightforward. We had arrived only moments after Palacios had given birth. We proceeded with some medical things, but the kids get a huge kick being able to announce how many patients they’re bringing to the hospital,” Anderson said. Anderson said moments like these are special for everyone involved. The youngest of three brothers, Martinez is a junior at Darien High School who likes history, and though he didn’t volunteer for Post 53, he’s thinking of volunteering at the Fire Department during the summer, a position he thinks sounds like fun. The picture that hangs in Post 53 with Palacios, Clark, Martinez and the “posties” who answered the call was taken a week later in the Palacios’ home as a way of commemorating the occasion. Clark adjusted her glasses as she recalled the craziness and ultimately the joy of that night. “I was with my grandson the second he was born and stayed here all night — I couldn’t even sleep. I was very worried, but it was a miracle and that’s why Matias is so special to me,” Clark said.